Are you ready to upgrade your shower? Finding the best shower faucets is an essential part of getting the cleansing experience you deserve, which is why we have compiled a list of the top models available. These days, shower faucets come in all shapes, sizes, and styles. No matter what type of bathroom you have or what type of shower you’re looking for, there’s a model that suits your needs. Let’s see what these shower faucets have to offer. For many people, taking a shower should be a relaxing and transformative experience. To help achieve this effect, it’s best to install a rainfall type shower head. This model from Delta Faucet is one of the better options out there, thanks to its unique square design and layout. What sets this shower faucet apart from others is that it sticks out from the wall so that the water pours down vertically on top of you. With other “rainfall” heads, they are still at an angle, which means that the effect is not as pronounced. This model is perfect for when you want a refreshing and relaxing shower. You’ll feel like you’re in the rainforest. Unfortunately, while the position can be ideal in most situations, the downside is that the head can’t really be adjusted. Thus, if you want the option to switch back and forth, you will have to get a different shower faucet instead. This model is perfect for rainfall, but not for a strong, powerful flow. One reason this shower faucet is so relaxing is that it reduces your water pressure. Thus, rather than getting pelted by strong blasts of spray, you get to enjoy the rainfall as it cascades down gently. Nonetheless, you still get the full amount of water coming out (up to 2.5 gallons per minute), meaning that cleaning and rinsing yourself off is a breeze. Another element that we like about this shower faucet is the touch-clean nozzles. These are rubberized tips that allow you to remove lime scale and calcium buildup with the touch of a finger. Thus, this is a low-maintenance model that will last a long time. Coupled with the quick and easy installation, you will love this shower head. If you have a vintage-style bathroom, then you will love this next shower faucet from Rozin. When looking at it, you will think that you’re living in the early 20th century, thanks to the classic components and antique finish. Fortunately, even though this faucet looks old, it comes with some modern features that make it an excellent choice for any bathroom. One noticeable feature of this faucet is that it comes with two handles instead of one. Most modern varieties will have a single knob that you turn for hot and cold water, but this allows you to mix your water more precisely so that you can always be sure that you’re getting the right temperature. The faucet includes all of the connectors you need to make this work as well, so installation won’t be too complicated. Another benefit of this faucet is that it has two showerheads. The first is a rainfall head that cascades water down upon you from above. There is also a handheld showerhead so that you can clean your body more thoroughly when necessary. Although the handheld head doesn’t have adjustable options (i.e., massage), it works great for cleaning the rest of your body. We like the fact that the top showerhead is also adjustable. A knob on the side allows you to move it up or down based on your height and your preference, so you’re sure to find the right option for you. Overall, customization and personalization are the primary selling points of this shower faucet. As with most modern heads, this shower has rubber nozzles so that you don’t have to worry about limescale or calcium buildup. This ensures that the faucet is low maintenance and that it will last for a long time. While the shower faucet above from Rozin took us back in time, this two-in-one faucet from Sunuan is a modern masterpiece. Utilizing clean, sharp lines and geometric shapes, you can feel like you’re in an art installation every time you take a shower. With this system, you will probably want to consult a plumber to get it installed, so keep that in mind. Other shower faucets are easy enough to put in yourself, but since this one has a sleek, in-wall setup, you will want to have a professional help you out. Once it’s finished, though, you will be impressed by how clean and elegant it appears. One of the ways that this shower faucet offers simple innovation is that you can switch back and forth between the heads using the knob on the wall. Other models require you to do this on the head itself, which can be a little annoying, especially if you’re not that tall. This way, you can move from one to the other much more conveniently. The handheld showerhead has its own mounting bracket, meaning that you can position it on the wall as you see fit. Other units have each piece attached to each other, so it’s nice to know that you can customize the placement of the showerheads when putting this faucet in place. The other benefit of the handheld showerhead is that it’s angled so that you can get a better grip on it. It also ensures that you can clean your whole body more conveniently since you can reposition the head more easily. Overall, even though the installation is not as simple as other shower faucets, we like the elegance and versatility of this model. As we’ll see on this list, most of the shower faucets available today are two-in-one units that come with both a rainfall showerhead and a handheld head for more personalized cleaning. In each case, the appearance of the faucet is excellent, thanks to the ultra-modern design and reliable finish of the metal. In this case, though, there is an additional feature that sets it above the rest. 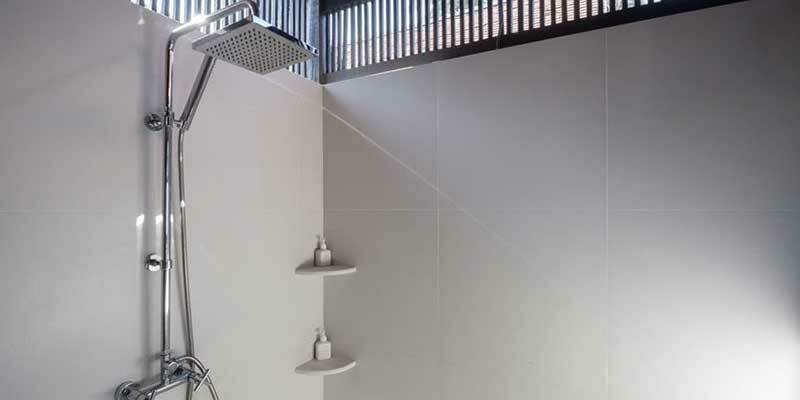 The Embather Shower System also comes with air injection technology. This means that air is mixed with the water to help you get a better flow rate without having to use as much liquid. Overall, you can save up to 30% on your water bill compared to other shower systems. The other side effect of this technology is that it’s much quieter than most other showerheads, so keep that in mind as well. Installing these types of faucets can be a little tricky, so you will probably want to consult a plumber before you get started. While you can mount the heads as you see fit, you want to be sure that you’re doing so correctly so that they won’t rip out of the wall by accident. Also, you have to ensure that the pipes are connected well behind the wall so that you don’t have to worry about leaks. When picking out the best shower faucet from this list, you can choose from either a model that is integrated into the wall or a unit that is all one piece, like this one from Senlesen. The vintage-style design and the ease of installation make this (and others like it) an excellent choice for people who want class and convenience in their showers. One thing that we like about this faucet is that it comes in a variety of colors and styles. Although the shape and function of the faucet are old-fashioned, you can get modern finishes that will enhance the look while also protecting the materials from normal wear and tear. Stainless steel and brass connectors will resist corrosion so that this faucet will last. The other thing we appreciate is the fact that this unit has two temperature handles. This way, you can adjust the hot and cold levels as you see fit, rather than trying to maneuver between the two on a single knob. Best of all, the connections required to implement this system are all included so that you don’t have to spend time looking for them. So far, we’ve been looking at shower faucets that have a single purpose. While these units can be great for many people, others may prefer to have some additional functionality in their shower. In that case, you will probably want something like this kit from Delta Faucets. What’s nice about this particular model is that it has modern convenience and performance with a vintage style. Also, it’s super easy to install (compared to other units on this list), so you can have it up and running in no time. This shower faucet comes with five settings so that you can get the most out of each shower. They range from relaxing rainfall to high-powered massage options, meaning that you can satisfy a broader range of needs while cleaning off. One thing that we like about Delta products is that they are built to last and to be high-performance models. Inside this faucet is a built-in pressure valve that ensures you always get a reliable stream, even if the pressure in the pipes drop. Also, this system can regulate the water temperature so that you don’t accidentally scald yourself when trying to find the right setting. As with other showerheads, this unit comes with soft, rubberized nozzles. This material is super easy to clean, thanks to the fact that it resists buildup of calcium and limescale. Even if some stuff does collect, you can simply wipe it off with your finger, making cleanup and maintenance a breeze. For many people, their showers are individual stalls that don’t connect to a bathtub. However, if you have a shower system that enables you to take baths, you need a faucet that can accommodate you. This model from Moen is such an option, making it a viable choice for any bathroom that uses both a shower and a tub. While the system itself is not very complicated, it is built to last. Moen is one of the top brands for making high-quality shower faucets, so you know that you’re going to get some of the best value for your money with this system. One element that we appreciate is the LifeShine finish of each piece. Most shower faucets are made of stainless steel to help prevent corrosion and rust, but these faucets and spouts are treated to give them a magnificent luster along with the durability of stainless. Simply put, you can be sure that this system will not only look incredible for years to come but it will hold up to all kinds of environments. As with Delta Faucets, this system also comes with a pressure regulator valve inside to both help control the water temperature and ensure that you don’t get a drop in pressure while taking a shower (or bath). Overall, this is an excellent choice for those who value ruggedness and simplicity. If you like the idea of having a flush mounted shower faucet, but you also need a tub spout, then you will love this model from Artbath. Not only does it allow for a better finish when installing, but it has a sleek, postmodern design that will add value and integrity to your bathroom. As with other units we’ve seen, this shower system has both a rainfall head and a handheld model. Both of the heads look incredible, thanks to their sharp angles and geometric shapes. While we would like them better if you could customize the water flow, they are excellent as is. With most other showerheads, the spray nozzles are made of soft rubber so that they’re easy to clean. In this case, however, they come with large plastic panels instead. This means that you can wipe them down and clean them more easily. Also, plastic won’t rust or corrode, so you can rely on this shower faucet for years to come. Another reason we like this shower faucet is that it’s a low-flow design. For some people, that can be an issue because they like having higher pressures, but considering that the showerheads have a rainfall setup, it makes sense for this system to use less water. As a result, you can save a lot on your utility bills. Next, we have another flush mounted shower faucet. This model from SumerRain is a simple and elegant design that will give you custom options regarding where you place your showerheads and how they function in your bathroom space. Overall, this setup is about as simple as they come. It has a single knob for adjusting water pressure and temperature, and another one to switch back and forth between the rainfall showerhead and the handheld unit. Unfortunately, you can’t use both at the same time, but that shouldn’t be much of an issue for most people. We like the sleek, modern styling of this shower faucet, as well as the rugged stainless steel and brass materials. Each part has a brushed nickel appearance, giving it a timeless quality that will look right at home in your bathroom, regardless of the decor you have inside. Our final shower faucet system is an all-in-one unit. What makes this model nicer than the others is that everything is attached to a single piece, meaning that installation is much more straightforward than other options out there. Also, because it has two showerheads and a tub spout, you can be sure that it will work in your bathroom, regardless of the setup. One unique feature that we really appreciate about this faucet is the fact that the tub spout is on a swivel. This means that you can move it out of the way when taking a shower so that it won’t be a hazard. With other faucets, the tub spout can be more frustrating than anything, so we appreciate the customization offered here. As with other vintage-style shower faucets, this one comes with two temperature handles. This ensures that you can get a precise range of hot and cold when taking a shower, which is much better than a single knob system. All of the installation components and connectors are included with this faucet, so installation is even more of a breeze. Other features of this unit include adjustable height positioning of the top shower head, stainless steel parts that won’t rust or corrode, and rubberized spray nozzles for easy cleaning. Overall, if you want performance and simplicity, you will love this faucet. For the most part, we looked at shower faucets from a lot of different “specialty” brands. While these models look good and are functional, they aren’t quite as reliable as Delta Faucets. If you want to be sure that your system will hold up for a long time and will stay in pristine condition, we highly recommend both Delta Faucets. These models are not only high-quality, but they look incredible and will instantly upgrade the appearance and functionality of your shower and bathroom as a whole.